Something magical happens when we dare to get real and speak the truth about money. In this intimate conversation series, I chat with people from all walks of life about their money journeys: the good, the tough, the soulful, and the nitty-gritty. Curl up with a cuppa as we pull back the curtain … and get ready to get inspired. I was drawn to this woman. Even across a crowded California conference room, packed and bustling with hundreds of high-powered, charismatic women — I could feel her presence. I wasn’t sure what it was about her, I just knew I needed to talk to Keisha P. Shields. When I finally interviewed her recently, WOW. I was blown away — and I’m delighted to share our conversation with you today. Keisha shares so powerfully in this conversation: about her gifts, her vulnerable tough spots, the patterns she’s identified, and exactly how she’s overcome them. It was an honor to interview her — and I hope you soak up some of her charisma and enthusiasm! Keisha Shields is a highly-valued personal and business adviser to women leaders and is known for giving her clients huge “aha’s” from the onset of their work together. 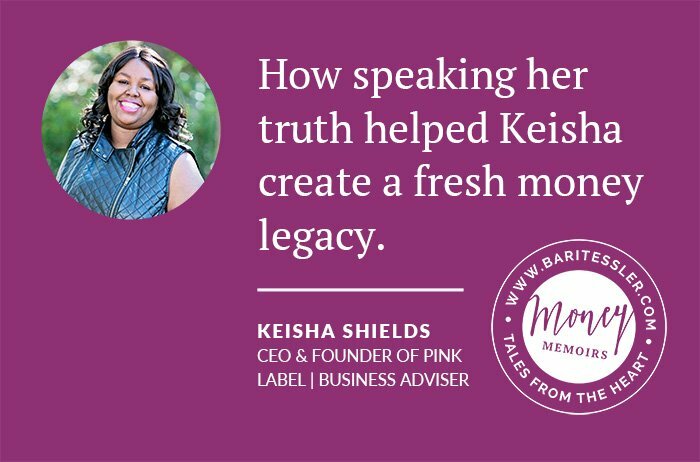 A former COO, Keisha has a knack for immediately identifying implementable strategies to help (primarily) women claim the high levels of compensation and recognition that they deserve for the value they bring to the table. Keisha pulls from a wealth of experience in diverse leadership roles to be able to bring clients a viable strategy no matter where they are in leadership, business or career. A philanthropist and humanitarian since the age of 6, in her early twenties Keisha founded a nonprofit to address the intricate needs of under-served populations whose voices were lost behind clouds of shame, stereotypes and stigmas, working with the state and federal government in doing so. A voice and story activist and speaker in both grassroots advocacy and legislative policy-making in the human rights arena, Keisha uses her business savvy & her strong intuitive presence and awareness to help clients claim their space as more highly visible leaders, find and own their voices publicly, say what they think without fear, and integrate their personal successes and stories profitably into their work. You can find Keisha’s website here. P.S. What’s the Money Memoir Series? It’s my unconventional interview series where I sit down with dear friends and colleagues to hear what they’ve learned about money. Because hearing other people get real about money can be SO healing. Un-shaming. Motivating. Downright inspiring. It’s also a fun way to give you a taste of the kinds of things I help people with (along with 30 guest teachers!) in my year-long money school, The Art of Money. If this approach to money speaks to you — you know, the one where we honor your numbers and emotions, your values and spreadsheets, your dreams, gifts, blindspots, and the whole journey of a lifetime that got you right here — you might love my global money school, The Art of Money. Explore The Art of Money 2019 here. How to earn more money. Practical tips from 3 powerhouses. a better money legacy for his grandchildren.